Girl’s Life Magazine featured a behind-the-scenes look at the making of the music video, chatting with McWilliams as she prepped for the shoot, and giving viewers an up close and personal glimpse of the massive amount of work and numerous personnel involved in producing a music video. The video, shot in McWilliams’ hometown of Austin, was directed by Emmy-winner Scott Rice and choreographed by Tina Landon, who has worked with Prince, Michael Jackson, Britney Spears, and Rihanna. With her smooth, fluid dance moves, McWilliams looks like a seasoned professional dancer. Yet when asked, she willingly acknowledges she spent two years practicing and improving her dance skills to attain her present level of expertise. Prior to the video’s release, McWilliams performed an unplugged version of the song on KIIS FM / iHeartRadio’s “Artist of the Week” program. She also appeared on KTLA TV and will be featured on Fox’s Good Morning Austin, on August 2. Then she joins the 2018 Boys of Summer Tour, along with Single By Sunday, Hailey Ona, and Mackenzie Sol. Although her life sounds like non-stop glitz and glamour, 16-year-old McWilliams is all about girl power, self-empowerment, and social awareness. She’s the official spokesperson for The Art of Kindness, a charity promoting art through kindness and anti-bullying. McWilliams headlined North Texas’ 22nd Wish Night gala in Dallas, on May 19. “Living For The Weekend” is not about non-stop partying. Instead, it’s about the cost of partying too much, displaying the consequences of self-indulgence and idle thrill-seeking. The video depicts a group of intimidating young girls who fix on robbing a bank, more of a lark than anything else. The robbery goes perfectly, until a hitch arises, causing the entire enterprise to spiral out of control, leading to dire results. The highlight of the music is McWilliams’ impressive voice, with its alluring textures and lilting control, as well as gleaming vocal harmonies. 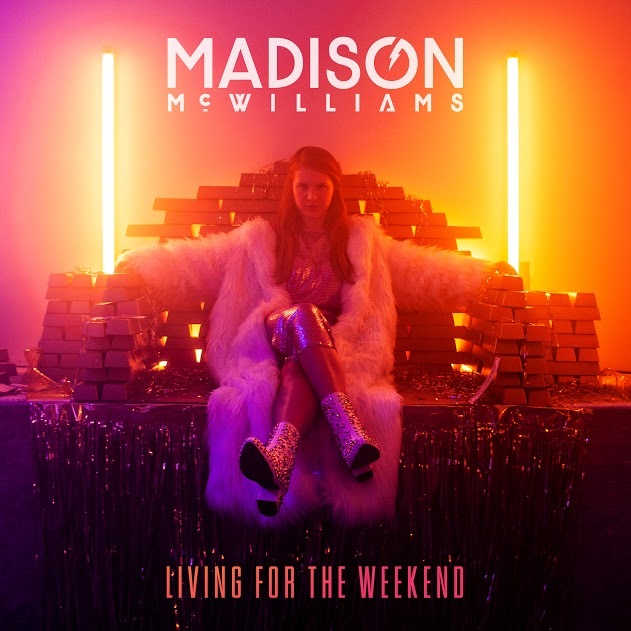 It’s easy to see why Madison McWilliams is destined to become the next pop diva.